Weaning is the process of gradually introducing foods other than breast milk into the child's feeding schedule. The growth rate in infancy being high, breast milk is not enough to meet the child's increasing needs for energy and protein. Milk is a poor source of iron and also provides a small amount of Vitamin C. They are sufficient to meet an infant's need until the three months of age. Weaning should be a gradual and slow process so as to make the child adapt to the new foods. The consistency and amount of weaning foods should be slowly modified according to the increasing age of the child. 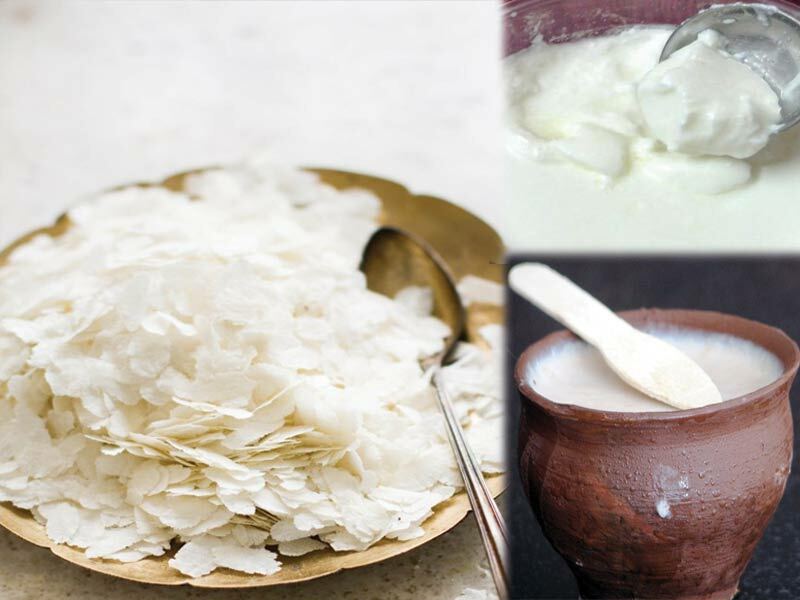 For older children, solid supplements that are cooked and finely chopped or lumpy, are suitable like well-cooked pulses, vegetable khichri, stewed fruits etc. Consistency should be slowly changed from liquid to semisolid and then solid supplements. The amount should be gradually increased. Only one new food should be introduced at a time. Only when the child gets used to it, another weaning food should be introduced. Force feeding should be avoided if the child shows a persistent dislike for a particular food. 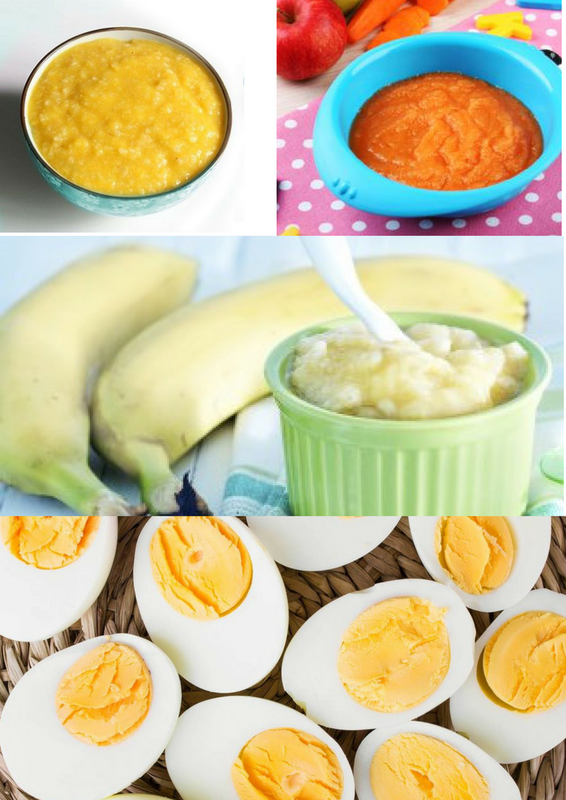 Use locally available ingredients while preparing a weaning food. Only salt should be used for seasoning. Although egg yolk may be started at the age of 4-5 months, egg white should not be given until the infant is 8-9 month old as it is likely to cause allergy in some children. 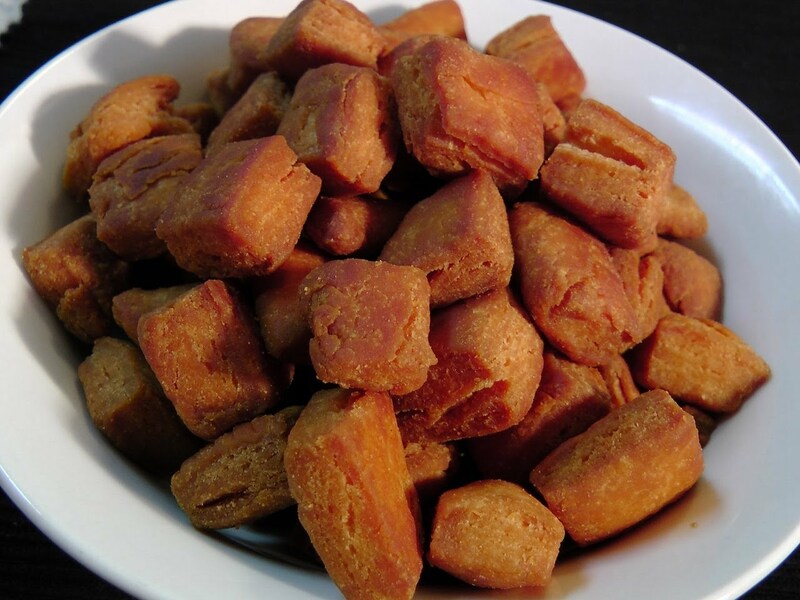 The fibre content of the weaning food should be low. Foods should be well cooked to soften the fibre. 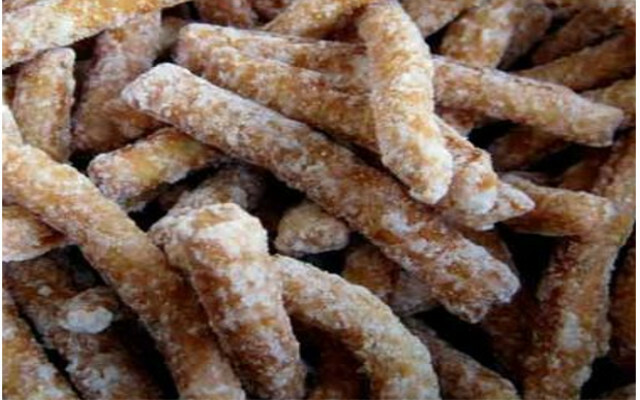 Highly flavoured foods should be avoided. Rice kheer is a very common pudding made in almost every home of India especially during special occasions like in north- navratri, janmashtami, in south- pongal and in east- chhath puja. For me my favourite version of rice kheer is mango rice kheer. This has the same taste as the ice cream when it served chill. 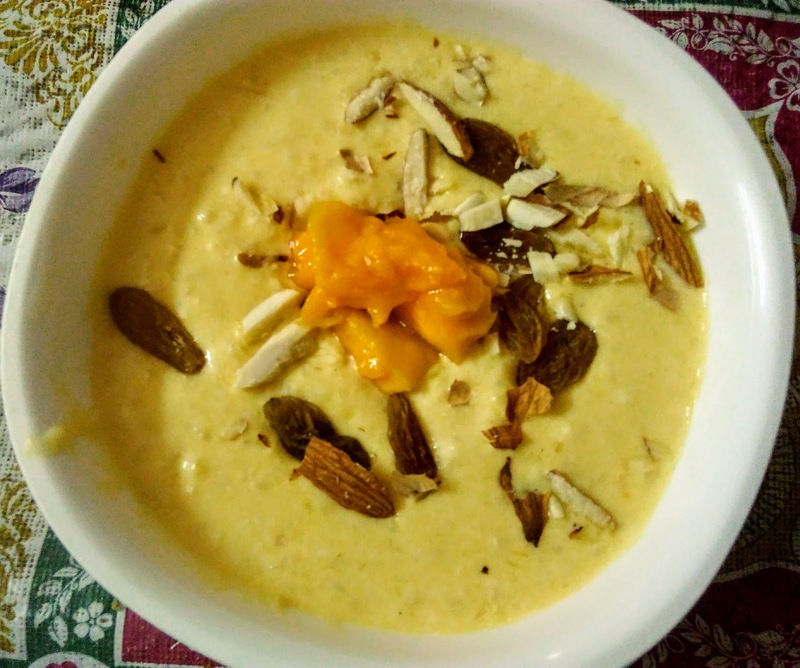 Mango kheer is a easy to make dessert ready with ripe mango pulp,full cream milk,rice/vermicelli. 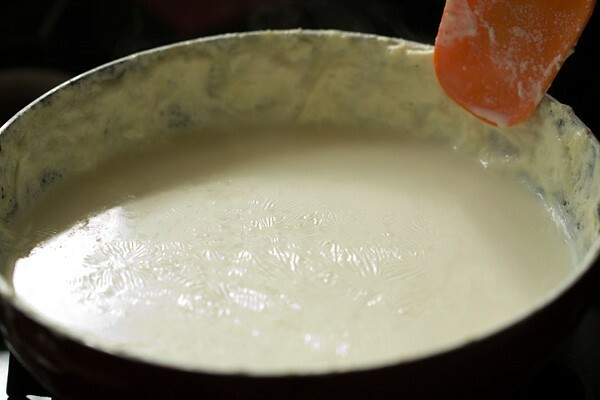 Firstly in to the heavy bottom kadahi or in pan pour full cream on high flame until it boil. In a mean time soak rice in to the water.When milk boils reduce flame to low to medium. Pour rice in to the milk and stir continuously until rice cooked and milk reduce to half. Mix sugar and cardamom powder. 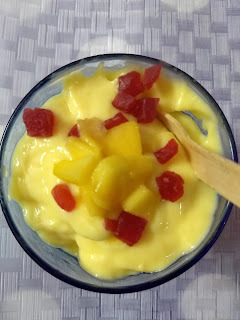 Now mix small mango pieces in to the kheer as it enhances the taste of kheer. 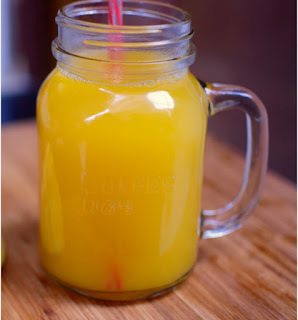 Cool down the milk and mix mango puree in to the milk. 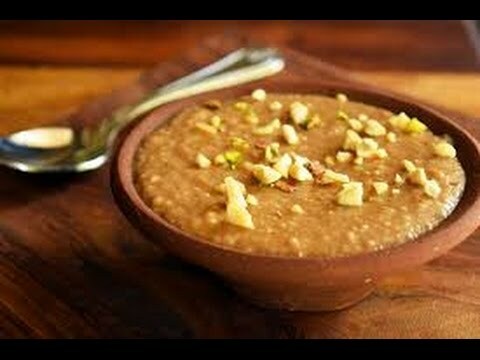 Mix nuts in to the mango kheer. Serve chilled and garnished with almond and small mango cube. Combine all ingredients in a big mixing bowl and mix all ingredients well with the help of whisk or you can also use a blender for mixing. 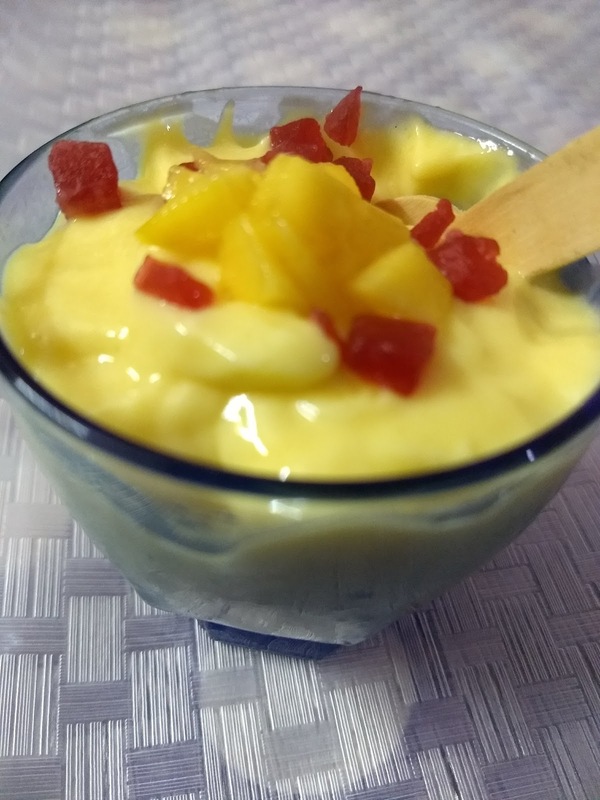 Now add finely chopped mango pieces and mix with the spoon as it increases the taste of mango yogurt. Refrigerate at least 1 hour and serve chilled garnished with tooti-frooti or mint sprigs. 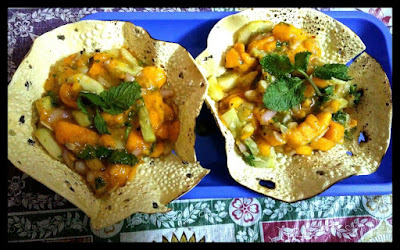 Peel skin of mangoes, chop in to the pieces and discard the seeds. Put the chop pieces into the pressure cooker and 1-1/2 glasses of water. Close the lid and boil it for 4-5 whistles on high flame. In a mean time,add sugar and one glass of water in a pan and put it on a high flame until sugar dissolve in to water completely. Wait until sugar syrup and mango pulp cool down completely. Blend mango pulp and sugar syrup in to the blender and blend in to smooth paste. Take out in to the big pot or jug and add water according to your taste. Cover and put it in to the refrigerator for 3-4 hours. Serve chilled with ice cubes. You can also add sugar directly in to boiled mango pulp when you open lid of the cooker and boiled sugar with mango pulp for around 2 minutes and switch off the flame and blend it. You can also add black salt, salt, chaat masala and black pepper powder to makes it tangy and spicy. I lived in Delhi but my native place is in Bihar. 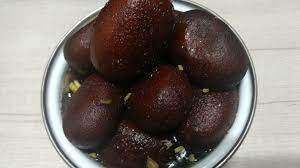 I have seen a lot of good bihari recipies cooked by my mother. 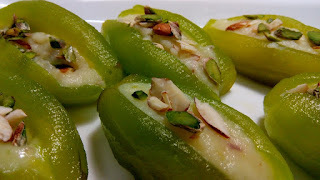 I want to share those recipes to all of you so that you can also enjoy these yummy and delicious recipes at your home. 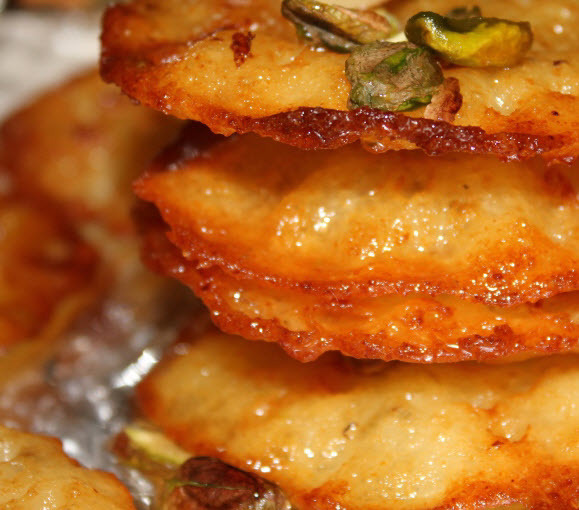 In all the season , regular food items are rice, roti, achar, chatni, dals and milk products with some variation. 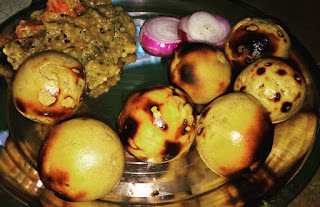 Mustard oil and zeera (cumin) or panchforan (literally "five seeds"), namely saunf, sarson, methi, ajwain and mangraeel (Kalaunji) used for "chhounkna"/"Tadka"(tempering) of some vegetables. 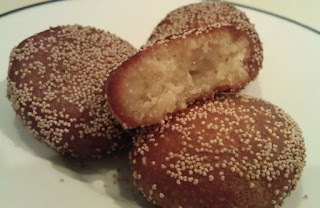 There is a lot of light frying, called bhoonjnaa, in Bihari food. One of the most remarkable thing about this cuisine is "smoked food". 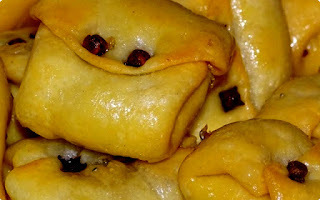 It refers to using smoked red chilli to infuse a strong aroma in food. 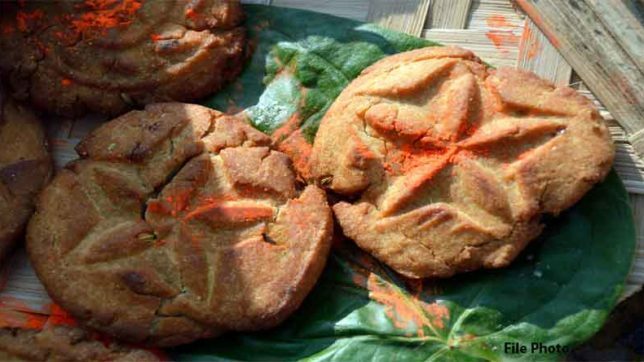 It is used in preparing "chokhaa", i.e. 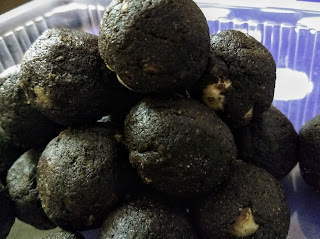 mashed brinjals/potatoes/tomatoes, either single or combined. Smoked chilli is also used in preparing kadam (a common fruit sweet sour in taste, technical name Anthocephalus morindaefolia) chutney. Litti- Powdered roasted Chana is mixed with chopped onions, green chillies, lemon juice, coriander leaves, mango/bharwa lal mirchi pickle masala and oil. 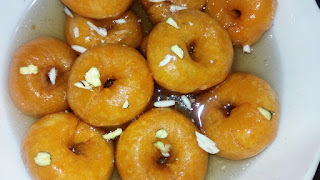 This mixture is filled inside atta and either made over cow dung(Upla) or deep fried with oil or baked in gas tandoor. 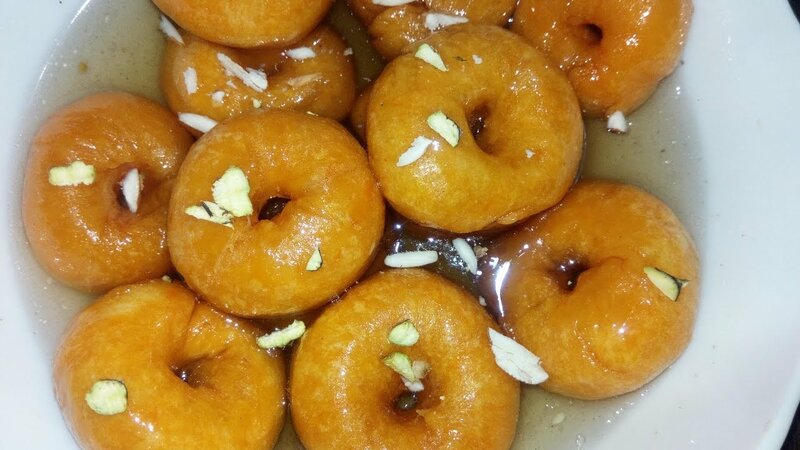 Best accompanied with Ghee and Chokha/baigan bharta. 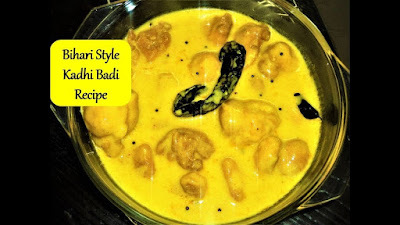 Kadhi-Badi - these fried soft dumplings (Badi) made of besan (gram flour) are cooked in a spicy gravy of yogurt and besan. It is served with Rice. 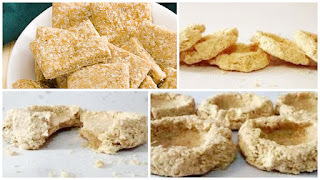 Chokha, papad, ghee aur anchaar"
Ghugni - It is a preparation made of black grams soaked (either lightly/overnight) in water and then sauted in mustard oil in a wok. All kinds of garam masala made the paste on a sil is used for flavouring and chana is also ground to form a paste used as the thickener. This thickens the masala and makes gravy as per desire. After proper seasoning and bhunjana water is added to the mix for gravy as desired. 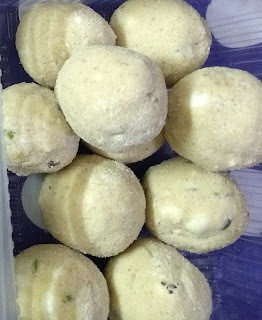 Pittha - It is known as bihari momos. It is either in a shape of a semi circular, ball or boat. 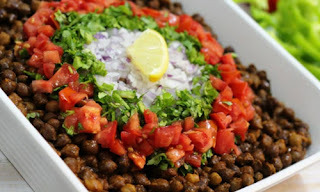 It's filling made of the paste of Channa Daal (soaked overnight and boiled), dry masala. 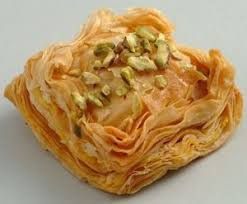 It's upper crust made of rice flour dough then steamed in the streamer or traditionally dip in the hot boiling water in any deep vessel. 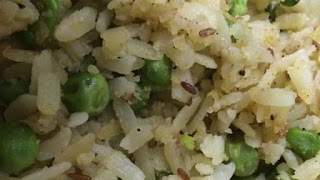 Choora- beaten rice, used in fast food and main course. In main course, it served with a creamy curd and sugar or jaggery. This is main traditional food on the occassion of Makar Sankranti. Another savoury dish made with Choora is Choora-Matar, Choora is roasted and accompanied with a thick spicy preparation made of peas and onions. Sattu - powdered baked gram, a high energy giving food and used all the season. In summer it is consumed as a drink mixed with water, It keeps your body cool. Sometimes, sattu mixed with spices is used to prepare 'Litti' and stuffed 'chapattis', locally called as 'makuni roti'. 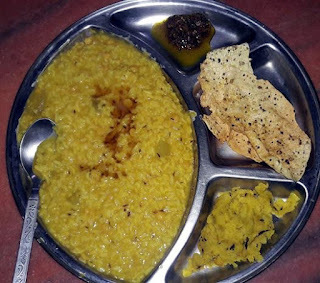 Dhuska- a deep fried item prepared from a paste of soaked rice, Chana Dal and Urad Dal(dhuli) mixed with spices and then deep fried in mustard oil/ghee. 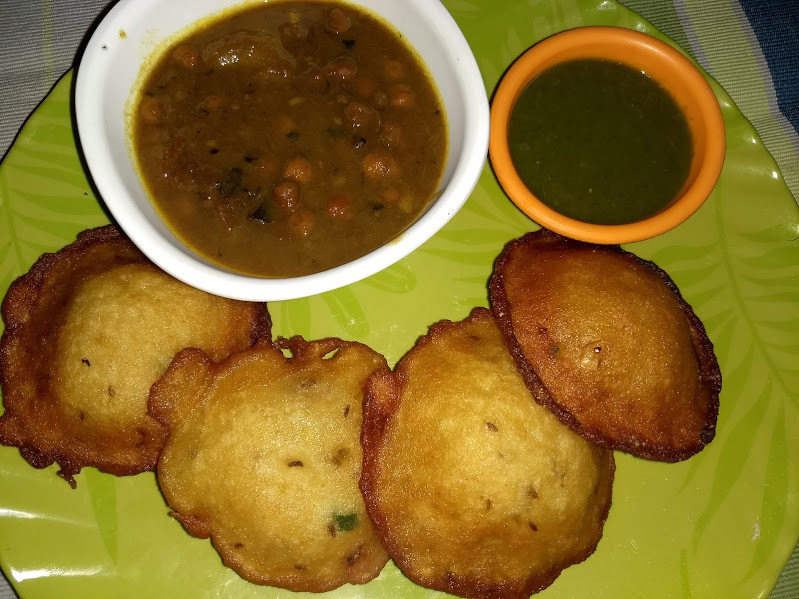 It is served with Aalu Chana sabji.